We are your local community connection for high quality foods, friendly service and the best prices we can offer. Hired Man's Grocery and Grill, Inc. is owned by Clint and Jenny Osner, both lifetime community members of Conway Springs. Hired Man's was built from the ground-up in 2007 using lots of our extended families time and talent for help. We opened our doors for the first time on July 15, 2008, and have enjoyed serving our community since then. We are very thankful for our community's support. 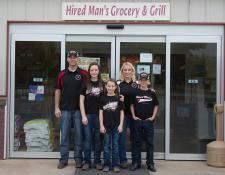 At Hired Man's you can see lots of family involvement too in serving the community. Jenny's mother, Nancy Koester, serves as the daytime manager and Clint's parents, George and Donna Osner, are busy helping in the meat department. Clint and Jenny also have three children: Karlee, Colby, and Haylee. We believe in our community and support our local schools, children activities/needs, and community organizations and events. Our family-owned store offers a convenient one-stop shop where you can find what you need. We take pride in our community and support many local events and organizations. We appreciate your local support and also believe in giving back to the community. You utilize the years of our experience in food.